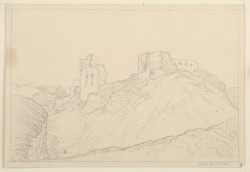 Drawing of the ruins of Castell Dinas Bran in Denbighshire. This was built, probably in the early 12th century, by the Welsh. It consisted of a stone walled rectangular enclosure with a square great tower. Additions were made to the castle in the 13th century. It was captured by the English during the Edwardian wars of 1277-1282. As this picture shows it is mostly ruined, and a view by Buck in 1741, showed it in a similar state.